Easter is just a hop around the corner! My children have a large age gap, so I am able to reflect on things that I did well as a parent and things that I missed the mark on when my older son was a preschooler. One of the best things that I did for him was to fill his preschool days with plenty of books. I never skimped on books and always encouraged his love of reading. He was an early reader. This has served him well academically. In hindsight, encouraging early literacy was one of my best parenting moves. Since I know that this worked so well for my oldest son, I do the same for my youngest son. We try to make reading fun for him. We incorporate books into birthdays, holidays, and even rainy days. In today's post, I'll share books that are fantastic for Easter. All of the books are from Scholastic, my go-to bookstore. Many of their books are sold at bookstores nationwide, but you'll also conveniently find all of the books featured here on the Scholastic website. Let's start with Peppa Pig books! 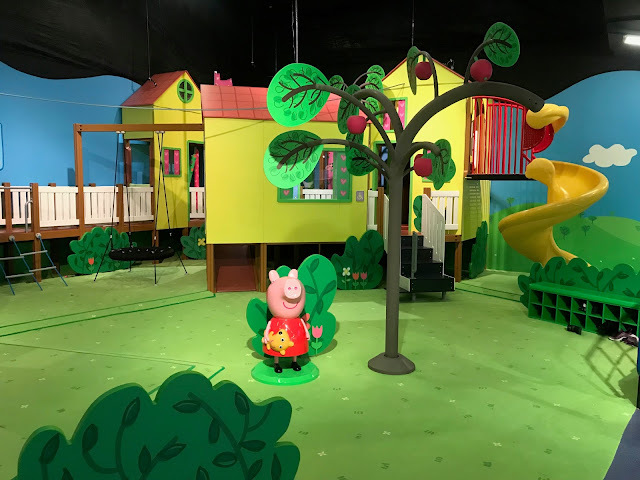 If you live in the Dallas/Fort Worth metro, I'm sure that you know about the Peppa Pig World of Play. (Click here to read about our visit.) This trendy play center is incredibly popular. You have to buy tickets in advance because it fills up quickly. Scholastic has the best Peppa Pig books. Check out the beautiful basket and colorful books below. 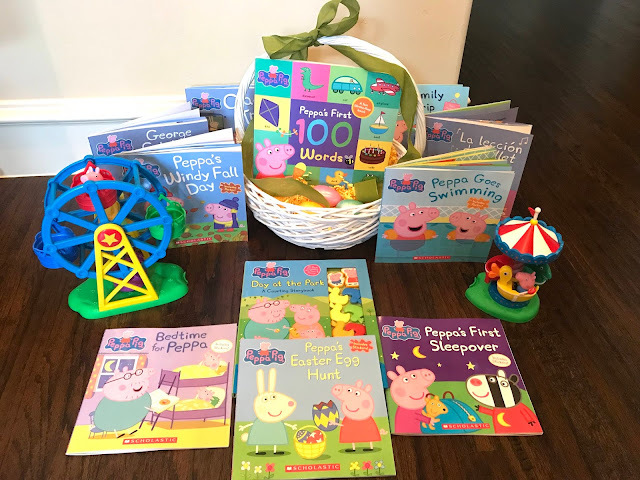 Scholastic has everything from Peppa's First 100 Words to the Day at the Park book that helps children to count. Older preschoolers will love the fantastic selection of short stories, including Peppa's Easter Egg Hunt, Peppa Goes Swimming, Peppa's First Sleepover, Bedtime for Peppa (a personal favorite! ), Peppa's Windy Day, and more! Scholastic has 70+ different Peppa Pig books that you'll love. Click here for the list. The photo below shows a few more books that are perfect for Easter. Pikmi Pops: The Missing Easter Bunny is a trendy book for preschoolers. (Actually, my 8 year old loves this book too!) It even includes scented stickers. 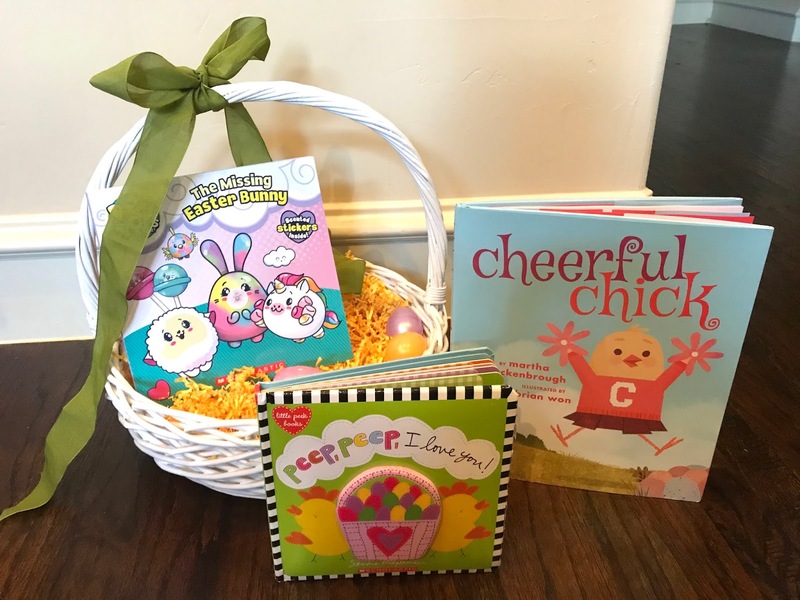 The Cheerful Chick book is another great Easter gift. This chick's enthusiasm is contagious, even if it takes some time. Preschoolers are still learning social skills, so I love this book from a developmental standpoint. Plus the colorful characters and fun story keep my son's attention. Finally, I saved our absolute favorite for last - Peep, Peep, I love you! This little peek-a-boo style book is a must-have for preschoolers. My older son had a similar book that was so worn from all of the "peek-a-boo" sessions of reading it that we had to tape it together several times and then eventually recycle it. When I saw this book, I was thrilled because I knew right away that it was a book that we would read over a hundred times! I love baby giggles and this book delivers - my toddler giggles nonstop when we read it and use the peek-a-boo features. Thanks for taking a peek into our family's Easter traditions and some of our favorite books! I hope that you enjoyed learning about our family's focus on early literacy. When you have the right books, you'll find that reading is fun!